CM Pump Series 3-5 c/w 18liter pressure tank and pressure switch for automatic start/stop to provide and deliver instant water supply with uninterrupted pressure for your daily needs. Longer life - Major pump components are manufactured from corrosion and wear resistant stainless steel. 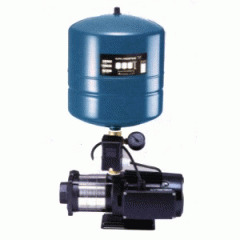 Quiet Operation - Both pump and motor are designed for quiet operation to provide a comfortable environment. Quiet Assurance - Each CM-PT is factory assembled and tested before delivery.